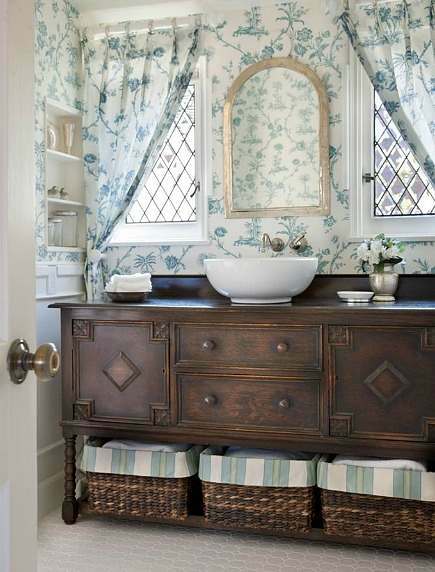 Repurposing a sideboard vanity shows how to create a one-of-a-kind antique piece for the bath. My daughter’s master bathroom remodeling project has been put on hold while we play the waiting game — the vanity is on backorder for a month. Meanwhile, I keep revisiting the option of repurposing a vintage piece, even though I don’t think it’s the right choice for her house. While it’s is important to do what you love in your home, resale comes to mind. In my daughter’s case, going vintage might scare away many potential buyers in her neighborhood. That said, this Jacobean oak sideboard [top] would be perfect with its dark stain and low shelf for fabric lined baskets — important for a room lacking storage. The charming space is a mix of masculine and feminine with the strong lines and visual weight of the vanity along in contrast to the delicate floral wallpaper and fabric. This was an easy repurposing job, too. Going from the dining room to the bathroom only required the simple addition of a bowl-style vessel sink and single lever wall mount faucet. At only $75, a mahogany buffet was a steal for a homeowner/blogger. The double sinks were offset just a tad (not centered over the side cabinet doors) so there is a bit of counter on each end. And storage wasn’t completely overtaken by the plumbing. A Cararra marble counter and backsplash were added, and the marble tones repeated with the white painted beadboard and soft gray walls. Recessed medicine cabinets provide storage for Mr. and Mrs. Note how, towel bars were cut to size for each end of the vanity, keeping the wall visually clean and clutter free. Hardwood floors. sealed with tung oil, are water friendly and the white cowhide rug, heavy cotton chenille upholstered chair and Czechoslovakian chandelier are other elaborate bathroom additions. So I’m rethinking my daughter’s project once again. I bet I’m not alone in that either. Wow this is beautiful. What a great idea. 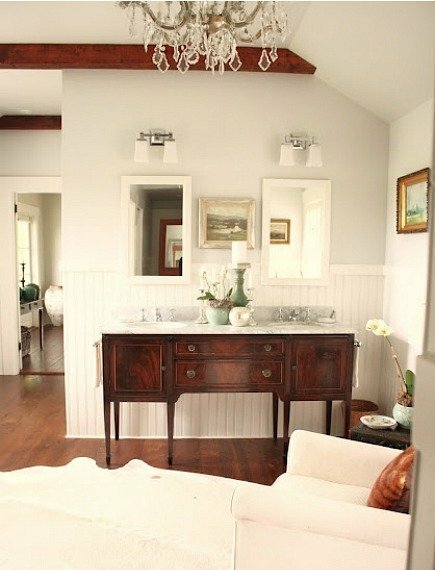 Now I wish my bathroom was big enough to do this but I only have room for a pedestal sink. Gorgeous! I love the baskets that add just the right touch to the otherwise heavy piece. Both examples are beautiful! It makes me wish I had kept my old sideboard instead of Craigslisting it. Looking forward to seeing what you end up with. If you want beautiful furniture in your bathroom, you have to use beautiful furniture in your bathroom don’t you? C’est la logique!